The information below describes the importance of this habitat to fish and wildlife, specific wetland/riparian habitat types found in Montana, and conservation measures that can be used to protect these sensitive areas. Wetlands, riparian areas, and water are particularly important habitats for wildlife. Migrating Birds: Much-needed food and resting areas for 65% of the birds that routinely migrate through Montana (51 of the 77 bird species that regularly migrate through Montana). Temporary wetlands that only have water in the spring are particularly important. Species of Concern: 30 of Montana’s 66 bird species of concern (46%). Fish: 100% of the habitat for Montana’s 85 species of fish that depend on healthy streams, including 51 species of native fish and 32 non-native (introduced) fish. Cottonwood forests provide habitat for more than half the bird species in Montana, while hundreds of thousands of spring and fall migrating birds seek these riparian corridors for food and shelter. In the western United States, they support a higher diversity of breeding birds than all other western habitats combined. Click here for more. Wetlands and riparian areas make up less than 3.3 percent of Montana’s land base, yet remain the most important wildlife habitat in our state. However, the same places that attract wildlife are also attractive to people. 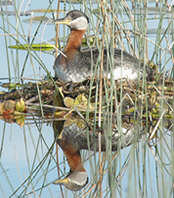 The protection and enhancement of Montana’s remaining wetlands is a priority issue for Montana Audubon. Because of this, we have initiated a series of projects, described below, that are designed to provide citizens and local government officials with the information they need to protect these important areas. Click here for more.